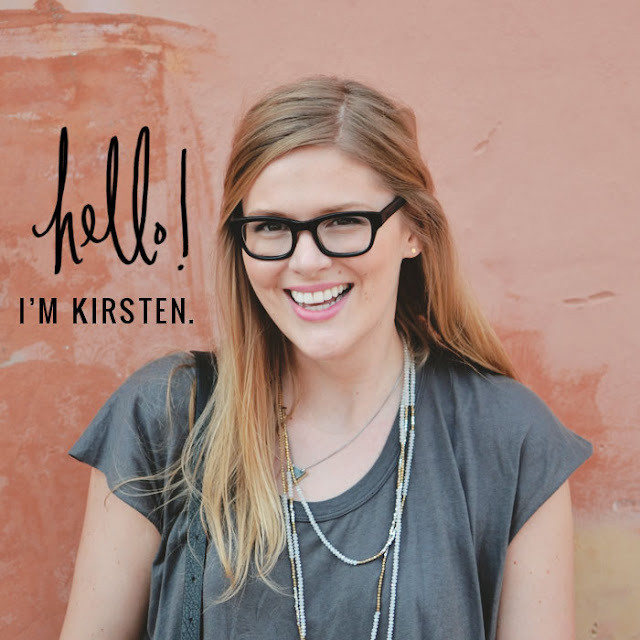 Chevron Friendship Bracelet Tutorial + Kollabora Craft Party! Earlier this week, I announced that I'll be co-hosting a Kollabora craft party in cahoots with Megan, Linda and Valerie during the Texas Style Council mixers. The bracelet-making bonanza is this Sunday at Stella Says Go. Are you planning on going? You better be if you live in the Austin area! I spent my childhood summers living in a cabin in the northern woods of Wisconsin making friendship bracelets and canoeing the lake, and would come home with my neck and arms absolutely stacked with colorful friendship bracelets. Chevron, stripe, stair step, woven rope....you name it, I wore it. 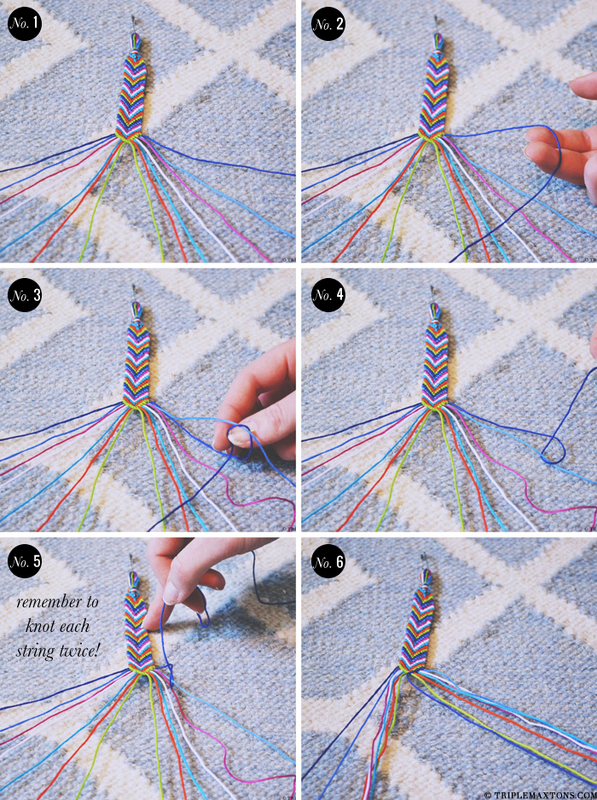 If you are a bit rusty on your bracelet making skills but really want to join in on this weekend's TXSC craft-a-thon, fret not....this tutorial is to the rescue. 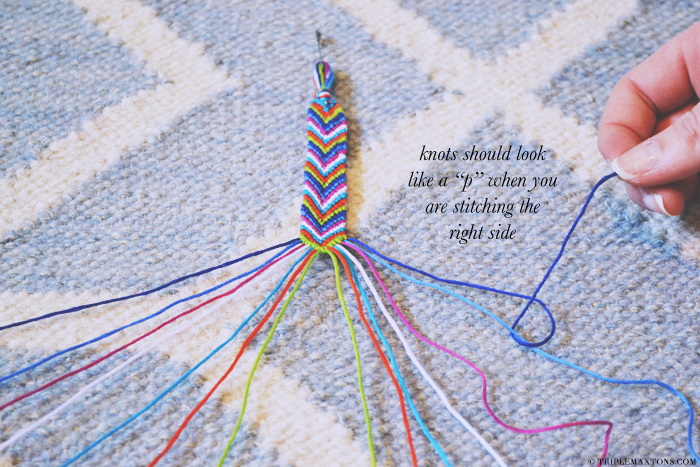 Here's what you'll need to make a chevron friendship bracelet: at least 4 colors of your favorite embroidery string, a safety pin, and some time. 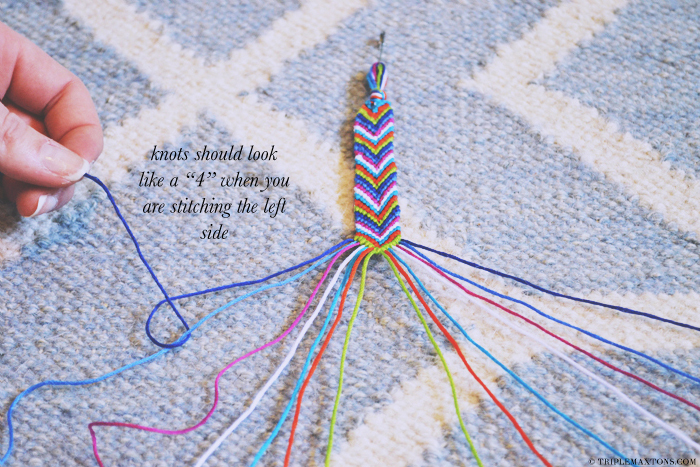 To start, cut a piece of string 72 inches long in each color you plan to use. Fold the cut pieces in half, and tie a slip knot at the fold. You should now have a looped tied end, which you can fasten to your jeans (or rug, in my case!) to keep the bracelet steady while you make your knots. Arrange the threads in the pattern that you like. For a chevron bracelet, you have two options. Option #1 is mirroring the colors on each side. For example: the left side is white, yellow, orange, blue and the right side is blue, orange, yellow, white. Option #2 is creating a mixed chevron, where the colors don't match up perfectly. For example: the left side is white, yellow, orange, blue and the right side is white yellow, blue, orange. Both look great, but for this tutorial, I am keeping it simple with a mirrored pattern. *Note: I started knotting several rows of this bracelet so you would be able to see the pattern better, since the beginning section was tricky to photograph. This whole project consists of left and right knots. Right knots look a bit like a "P," and a left knot is made the opposite way and looks like a"4." 1. Spread your strings out so you can clearly tell where the colors start repeating. 2. Starting at the far right side, you are going to start making right knots. Take the outermost string and place it over the string to its left so it looks a little like a "P." . 3. Pull the end of the string through the loop. 4. This is what your knot should look like. 5. Holding the string taut, pull the knot upwards. Repeat once more. 6. Repeat on each string until you get to the middle. Repeat steps 1 through 6 on the left side. When you get to the middle of the bracelet, the two colors of string you just knotted will be the same. Use a right knot to tie the two middle pieces together to make the chevron point. Keep knotting rows until your bracelet is long enough to wear. Finish your bracelet by braiding the strings from the left and right side separately. Tie a knot once you reach the end, trim the frayed edges, and pull one of the braids through the starting loop, and tie a bow. See....making a chevron friendship bracelet is so easy, even a caveman could do it! Show us your crafting skills, come say hi, join in on the fun, and make your very own bracelet with us this Sunday! I feel like we may have talked about this but where in Wisconsin? I went up north every summer too!!! balls yes! i was just thinking today about how i needed to make some friendship bracelets asap. and here this is...rad. This bracelet is so nice for my hand.. I'll try it..